Many years ago a few of us flower essence practitioners did an experiment. We wanted to see if we could beam or transmit the vibration from our flower essences to another person or animal by using crystals. We thought that in theory it would work, but we wanted to test it out to make certain. We worked with our own single essences which included flower, tree, mushroom, and gemstone. We selected few people and a few animals – none of who knew that we were using crystals so it could be a “blind test” with zero influence from our test subjects. To create a “double blind” test we took the name of the essence off the bottle so we would know which we were applying to our crystals. With giddy joy we found that putting a few drops of a flower essence on a crystal and 1) gave it to a person, or 2) put it near a cat or we anointed the tips of ears, or 3) used the power of our minds and intention to transmit the vibration, that all three methods worked! It worked when 1) a person took it in water or under the tongue, or 2) the cat was anointed on the tips of the ears or eat some off a food treat, or 3) we put drops on the crystal and asked it to beam to a person or cat in another location for long distance healing. Wondering if our success was serendipitous we did this five times over the course of a few months and each time we did it the results were the same – it was working! We have a very special mine where our crystals come from. The quality is superb, the vibration of these crystals is pure and they await YOU to clear them and to set your intentions so that they may serve you, your cats, and all of those who you love and care for. 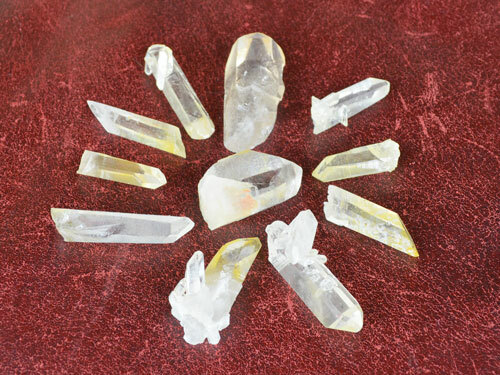 Currently we have AAA grade Water Clear quartz, and AAA grade Golden Healer quartz. 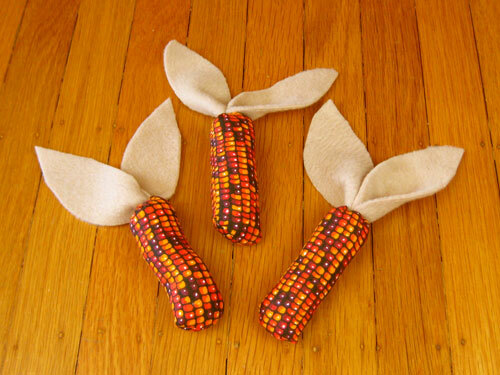 The Golden Healers are very powerful healing stones. They are special quartz crystals which grew on or near iron hydrate which give them that wonderful color which ranges from a pale wash of yellow, to deep orange with streaks. Right now the collection that we have are a pale yellow and with some specimens being almost water clear. 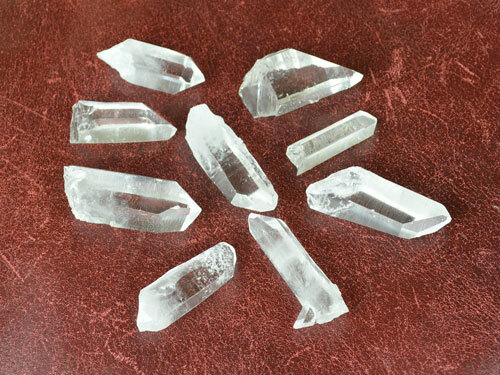 The AAA grade Water Clear quartz crystals are water clear or close to it. All of them have a pointed tip. We have had them on sale for the past few weeks and plan to continue this sale as the response has been really exciting. Times are a bit rough right now, and we and our cats need all the help, love, and healing we can get, soooooooooooooooooo the sale goes on! When you order our flower essences your lavender color handout will have all the ways you can use our flower essences including how to work with crystals. Golden Healers Quartz Crystals are themselves master healers, therefore they will help you master your own healing work. They will help you access The Gold Ray. They will help you transform, transmute, grow, change, evolve, find and feel joy, blossom and flourish. They assist you when you need to dissolve negativity and release it. Access your own Christ consciousness, Angelic and Devic energies, and the Goddess within. Golden Healers have a very high vibration or frequency and are very well suited to flower essence work. Welcome to a special clan of healers who work with Golden Healers. Join us in doing your own healing work to benefit those you love and care for, and those in your unique community. Water Clear Quartz Crystals are powerful and beautiful and will boost the effectiveness of flower essences and of Convivial House Cat. All you need to do is place a few drops of either (or both) products on your crystal and it will beam the vibration to where you’ve directed it. So simple! Detailed instruction will be found in your hand out for Convivial House Cat and our flower essence formulas. We are beyond delighted to tell you that you can turn your cat’s water into something with better flavor and something that’s vibrantly healthy – VitaJuwel Gemstone Wands. We have found hand blown glass vials in the shape of a wand filled with gemstones to vitalize water. Each wand is 7 inches long. 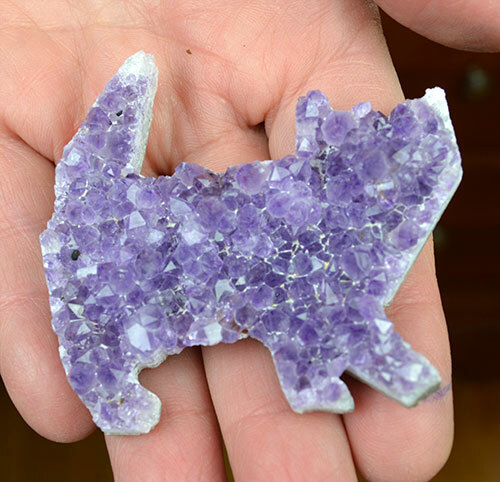 In just 7 to 10 minutes in a water bowl or a drinking glass and you’ll have vitalized water imprinted with the healing properties of amethyst, garnet and lots of quartz crystals. The water will hold the imprint of the gemstones for 2 days! When you place one of the wands in water it will have the same energetic quality and radiance of pure water from a free flowing spring – what a rare treat that is! The flavor is light and absolutely delicious. I’m not sure if I’m imagining this but my drinking water looks clearer. You’ll get so much millage out of your wand. You can place it in your cat’s water bowl for 7 to 10 minutes, then remove it, rinse it off, and place it in a 6 to 8 ounce glass of water for yourself. Masuro Emoto, who is famous for his books on water including The Hidden Messages of Water, tested these wands himself. Here you’ll see a photo of regular tap water – not pretty, actually downright ugly and scary! 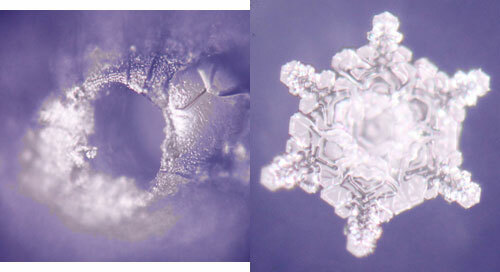 The photo next to it is a photo of water that was vitalized with a VitaJuwel vial/wand which is beautiful and healthy looking, a lovely snowflake! More giddy excitement from Cat Faeries: We are the first flower essence producer work to with the VitaJuwel Gemstone Wands to enhance the water we use in every bottle of our flower essences thus taking our work and the effectiveness of our flower essences to new heights! We’ve already begun using this enhanced water in our unique formulas for cats, and our single essences which allow you to create your own formulas. If you haven’t checked out our single flower essences they are listed below the cat formulas. You’ll get double-duty healing with our flower essences with vitalized water from VitaJuwel wands! Who doesn’t want to see their cats and themselves live long and very healthy lives? Cat Faeries are innovation leaders in all things healthy and natural, and we love taking you and your cats to a whole new level of health, longevity, and consciousness. Get your VitaJuwel Gemstone Wand today and transform your water!